A young Pezzella had not even begun school when scientists first discovered that a type of melanin can conduct electricity. Excitement quickly rose around the discovery because eumelanin—the dark brown pigment found in hair, skin and eyes—is fully biocompatible. Some researchers tried to increase the conductivity of eumelanin by combining it with metals, or super-heating it into a graphene-like material—but what they were left with was not truly the biocompatible conducting material promised. "All of the chemical and physical analyses of eumelanin paint the same picture—of electron-sharing molecular sheets, stacked messily together. The answer seemed obvious: neaten the stacks and align the sheets, so they can all share electrons—then the electricity will flow." For the first time, the researchers put films of synthetic eumelanin through an annealing process under high vacuum to neaten them up—a little like hair straightening, but with only the pigment. "We heated these eumelanin films—no thicker than a bacterium—under vacuum conditions, from 30 min up to 6 hours," describes Tassini. 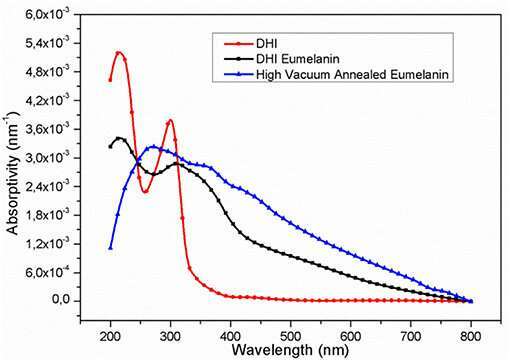 "We call the resulting material High Vacuum Annealed Eumelanin, HVAE." Although well short of most metal conductors—copper has a conductivity of around 6 x 107 S/cm—this finding launches eumelanin well into a useful range for bioelectronics.